Prof. Sanjay Bakshi’s portfolio reads like a who’s-who of multi-bagger stocks. When you peep into the Portfolio, you will be greeted by names like Thomas Cook, Relaxo Footwears, Kitex, Ashiana Housing, NESCO, Eicher Motors, Vaibhav Global and Poddar Developers. Joining this illustrious list of winner stocks is Symphony Limited, the manufacturer of air coolers, with a market capitalisation of Rs. 8,100 crore. Prof. Bakshi has now disclosed that he had issued a research note on, and recommended a buy of, Symphony, in January 2014. The note is worth reading for its clarity and simplicity. It calls Symphony “A Compelling Investment Opportunity in World’s Largest Air Cooler Selling Brand”. The essence of the note is that Symphony is a highly profitable company with high ROEs (98% in FY13) and zero debt. It also has multiple sources of Moat such as strong brands, wide distribution network and proprietary technology. It is also stated that there is a huge untapped growth potential because the addressable market is 132M households out of whom only 12M have coolers. It is also emphasized that the valuations are “compelling” because despite a mind-blowing 480x return in 10 years, the stock was then available at less than 13 times pre-tax earnings. Prof. Bakshi adds that the (then) market value is (was?) very low in relation to potential future value given the high profitability and scalability of the business model. Well, on the day Prof. Bakshi made the recommendation, you could have bought a truckload of Symphony for a meagre Rs. 400. Today, you will have to pay Rs. 2315 for it, meaning thereby that there is a mind-boggling gain of 400% from the stock in just 12 months. If you are wondering whether there is still any juice left in the stock, you have to read the latest research report by ICICI-Direct. ICICI-Direct states that Symphony can be expected to continuously post strong revenue, earning CAGR of 28%, 33%, respectively, for FY14-17E and maintain a dividend payout at more than 50%. ICICI-Direct foresees a target price of Rs. 2764 (39x FY17E earnings) for Symphony. One more stock that we have to keep on our radar is Vaibhav Global. Prof. Bakshi has recently come out with all guns blazing in favour of the stock. He calls Vaibhav Global a “highly profitable, cash generating, extremely well financed, and dominant business in its space” and has disclosed that he has bought the stock “after spending a lot of time thinking about the business, and the man who is running it”. Whether Vaibhav Global will match the performance of its peers in Prof. Bakshi’s portfolio remains to be seen. Before Professor has spotted this diamond, there are numerous brokerage houses, who have made a Long term Buy call on this stock. I bought this stock @340 range after a recommendation article from Dalal Street Journal. Have you guys tracked this stock SKM Egg Products? 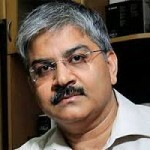 Could you let us know how you came across this particular presentation by Prof Sanjay Bakshi?